Sydney growers met recently with The Hon. 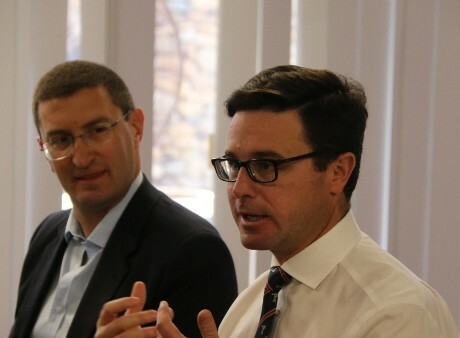 David Littleproud MP, Federal Minister for Agriculture and Water Resources, to voice business concerns, including the costs and red tape associated with importing plants. 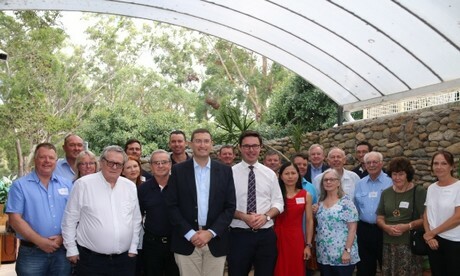 Approximately twenty growers attended, by invitation from Julian Lesser MP, Federal Minister for Berowra at the start of March at Dural Country Club. Attendees included representatives from Cameron’s Nursery, Engall’s Nursery, Overland Nursery and Lots-A-Colour. These growers raised several concerns including the need to invigorate horticultural career pathways, drought-proof horticulture and stop the flood of cheap imports into the country. By all accounts, the Minister was very receptive to the issues raised, especially those related to the import and export of plants. Sonja Cameron from Cameron’s Nursery highlighted to the Minister that the nursery industry prides itself on its biosecurity, awareness and preparedness. However, Sonja said that it is becoming harder and more expensive to import plants and plant material into the country, limiting the industry’s development. Sonja would like to see more Biosecurity officers recruited who are expert in and across the issues relating to ornamental plants, not only fruit and vegetables or cut flowers. Better training of existing officers would allow them to provide a more scientifically rigorous response to any plant rejections. Cameron’s Nursery recently had a shipment of 10,000 plants (tissue culture) destroyed. Sonja claims that Biosecurity officers said it ‘looked’ like the plants had a bacterial infection. Even more concerning, the relationship she had with the supplier of these plants is now broken due to the risks associated with importing plants into Australia. She claims that physical damage received by a plant during shipment may sometimes be confused and only pathology can provide a definitive answer. Sonja questioned the efficacy and cost of some of the treatments meted out to plants upon their arrival in Australia, e.g. additional hot water treatment of plants arriving with an acceptable phytosanitary certificate indicating they are free from Xylella fastidiosa. “Particular varieties of plants will not survive the combination of methyl bromide and hot water treatment”, says Sonja. “It is clear this is a barrier for introducing new genetics for horticulture”. When the initial X. fastidiosa ‘lock down’ occurred several years ago, Sonja claims that an import permit application that she then had in process was delayed without her being informed. Sonja would like to see the Department communicate directly to those people whose permit applications are delayed, providing them with a clear time of resolution or at least acknowledge when they are unsure as to how long the delay will be. Time is money after all! According to Sonja, the Minister agreed that it needs to be easier for businesses to import and export plants, calling for a more common-sense approach. The Minister said that departments could inhibit trade and he said that he wished that this was not the case, suggesting that trade agreements should make it easier for compliance between countries. The Minister concluded the meeting by asking growers to make him aware of their issues so they can be resolved. NB. The Minister for Agriculture and Water Resources was contacted for further comment but did not respond before the deadline.